Supersub Junior Morias snatched victory for Peterborough United at Gillingham today (March 25) with a stunning 90th-minute strike. Morias let fly from 25 yards and found the corner of the net to deliver three points Posh deserved following a strong second half display. A gusty wind and a bumpy pitch didn’t help two teams shorn of confidence, but few would have predicted an opening half that lasted 53 minutes to be so awful. 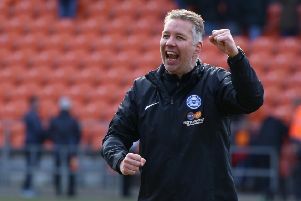 In mitigation there were nine changes to the respective starting line-ups, both teams lost a player to injury in the first-half (Posh lost striker Tom Nichols to a hip injury) and even referee Brendan Malone jacked it in after 35 minutes. He may well have been bored. Faced with the worst defensive record in League One, Posh created not a single opportunity in the first-half. Giant debutant goal-keeper Thomas Holy fielded a soft free kick attempt from Marcus Maddison, but otherwise amused himself with one huge clearance that sailed out of the ground and over the first row of terraced houses. Gillingham’s threat, such as it was, was a succession of mighty long throws from Max Byrne and Ryan Jackson. Jack Baldwin and Michael Bostwick dealt with them so well, Luke McGee did not have a single effort on goal worth saving. Match referee Brendan Malone after he departed the Gillingham/Posh game with an injury. Photo: Joe Dent/theposh.com. Posh boss Grant McCann is a lover of the beautiful game and must have had strong words with his players at the break. The quality was still lacking, but at least there was attacking intent. Paul Taylor was sent on for Leo Da Silva Lopes - who was making his 50th Posh appearance - before the hour mark. Maddison fired a long range free kick over the bar, but it was 66 minutes before Posh won a corner and it was proptly wasted. Gillingham’s half-time introduction of Bournemouth loanee Harry Cornick pepped the home side up. He shot just wide before Bostwick and Jack Baldwin both bravely blocked Bradley Dack shots from the edge of the area. Posh forward Marcus Maddison shoots at goal at Gillingham. Photo: Joe Dent/theposh.com. McGee was called into action just before the hour mark to grab a Cody McDonald header before Posh enjoyed a purple patch which included a 35 yard strike from Chris Forrester which Holy finger-tipped to safety and a Craig Mackail-Smith volley which drifted wide of the far post. And then Mackail-Smith missed a great chance to open the scoring for Posh after fine work by Taylor and Michael Smith, but the striker headed the latter’s cross wide.